With its vibrant energy and gorgeous tropical surroundings, the city of Cairns is a popular tourist destination for Australians and international visitors alike. Situated in North Queensland, Cairns is a fantastic gateway to the world’s largest coral reef – the Great Barrier Reef, a world heritage listed magical natural wonder. Furthermore, Cairns also encompasses golden beaches, tropical rainforests and offers an abundance of adrenaline-pumping extreme sports. 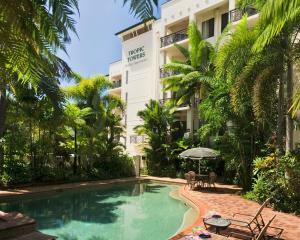 As the fourth most popular tourist destination in Australia, Cairns is a city full of activities. These include white-water rafting, diving and snorkelling, skydiving, kite flying, parasailing, fishing, going on Daintree Rainforest tours (with eco accreditation), trips to the Great Barrier Reef, sailing to small tropical islands and many more. Downtown Cairns also known as Cairns Esplanade runs along the oceanfront. The Esplanade is a fantastic location for many activities and offers a large swimming lagoon, public barbecue stoves, children's playgrounds, walking tracks, shops, restaurants and a Great Barrier Reef Cruise departure Terminal. The Cairns Railway Station and Cairns Central Shopping Centre border the relatively small central business district to the west, while Cairns International Airport lies to the north of the area. The Reef Fleet Terminal, located at the end of Pierpoint Road and jutting out into the ocean, offers the majority of the city’s tourist attractions. Here you’ll find a marina, busy wharves, and a shopping centre built on reclaimed mudflats. The Pier is also home to one of Cairns’ best luxury hotels, as well as several fantastic oceanfront restaurants, bars, and cafes, including Donninis Ciao Italia and the Pescis Mediterranean and Seafood Restaurant. 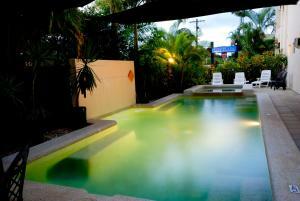 Cairns is an ideal place for a mix of adventure, fun or relaxation. 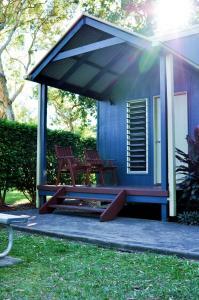 Accommodation to suit all budgets is widely available. 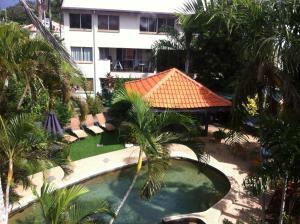 Known as the backpacker capital of northern Queensland, Cairns boasts nearly two dozen hostels and budget inns, where a basic bunk can be had for as little as $14 a night. 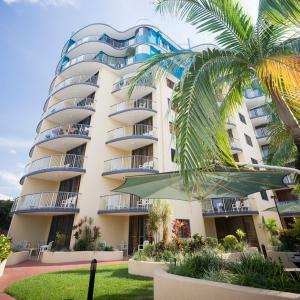 You’ll be spoilt for choice when it comes to accommodation in Cairns, but if you're planning to travel to the city during the June through September high season, be sure to book early enough to avoid the rush. Fresh food in Cairns is abundant. There are fresh seafood straight from the fishing boats, exotic lush fruits and vegetables that can be eaten by itself or turned into delectable dishes. 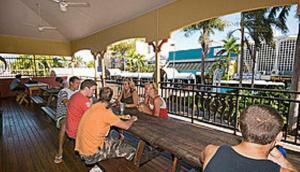 The Esplanade is the place to go for great local pub faire and casual restaurants. You can get a perfectly grilled steak, a cold microbrew, or the freshest catch of the day. Most places don’t open before 11am, in keeping with the laid-back vibe of the city. Head to one of the city’s small cafes or milk bars to mingle with the locals, or sample authentic Japanese food at one of the many restaurants that cater to the influx of Japanese tourists. Gourmet foods are also served in exclusive restaurants. Officially, Cairns follows a narrow strip of Queensland coast that runs from Ellis Beach in the north to Miriwinni in the south. There are dozens of suburbs on the outskirts and several different precincts within the city limits. Three of the city’s major shopping centres are situated in the south of the city, all located along Mulgrave Road, which eventually becomes the well-travelled Bruce Highway. The Bruce Highway moves through the southern part of the city, passing through Edmonton and Gordonvale. The major southern suburb of Cairns is White Rock, home to a popular scenic walk that offers fantastic views of the city. From almost anywhere in the city you can see White Rock Peak and Mount Sheridan hovering on the western horizon. The Edge Hill precinct is only a five minute drive by bus or car from the city centre. In fact, the walk from downtown Cairns to Edge Hill is quite pleasant for those who are relatively fit, providing you are not visiting at the peak of summer (when the heat encourages all but the most energetic to enjoy the air-conditioning). The main attractions in northern Cairns include Cairns Botanical Gardens, Mount Whitfield National Park, and the Tanks Arts Centre. There is also a quaint shopping centre with wonderful delis, a bakery, spa and salon services, and fashion boutiques. Closer to the city centre you’ll find Greenslopes Street and Centenary Lakes, a lovely walk that winds through the city taking in the local wildlife; perfect for birdwatchers and botanists. The residential areas of Stratford and Freshwater are home to some very cool cafes and boutique hotels, as well as the Freshwater Connection station where visitors will find the Kuranda Scenic Railway. 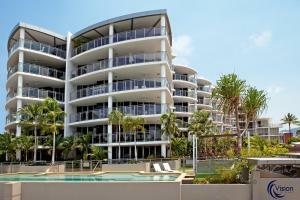 With so much to do outdoors, Cairns is a great place for families. The man-made saltwater Lagoon on the Esplanade is a popular spot for kids and is patrolled by professional lifeguards at all times. The Cairns Regional Gallery offers children’s workshops every third Tuesday of the month, holiday workshops for kids during school breaks, Saturday afternoon Kids’ Art Days, 'Tiny Tacker' Tuesdays every third Tuesday of the month, and free admission from 10am until 5pm on the first Saturday of the month. Muddy’s Playground is another family hot spot, offering fun activities to suit all ages. There are climbing nets, playgrounds, and 'water play areas' including rain shelters and jumping water jets. The park is located between Minnie Street and Upward Street. The historic Kuranda Scenic Railway is a refreshing change of pace for families in search of something a little different. You’ll ride a beautifully restored train on a scenic day trip from Cairns to a variety of locations outside the city, including the Kuranda Koala Gardens, the Australian Butterfly Sanctuary, the Skyrail Rainforest Cableway, the Tjupakai Aboriginal Cultural Park, and the Rainforestation Nature Park. 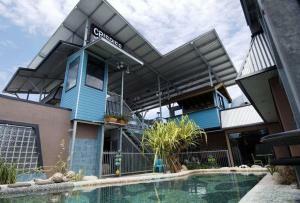 Cairns’ bars and nightclubs cater to students, locals, and visitors. You’ll find vibrant nightlife, plenty of great live music, dance clubs, corner pubs, breweries, and more. Rattle ‘N Hum on the Esplanade is one of the biggest venues on the strip, so it’s never too hard to get a table even though the restaurant is located in the middle of one of the busiest parts of the district. There’s a lovely outdoor seating area, pool tables, a wide selection of beers, and high quality pub food such as wood-fired pizza and burgers. Another popular spot is the Blue Sky Brewery Bar and Restaurant, located on Lake Street in the heart of the Cairns central business district. The bar, restaurant, and function rooms attract both locals and visitors. On tap, they have a good selection of boutique beers brewed on-site, as well as an impressive wine cellar, diverse modern cuisine, and a hip, laid-back tropical North Queensland vibe. The handcrafted beers are a must-try; each one is unpasteurised and naturally brewed, giving them a fresh taste and unique depth of flavour. The Woolshed Chargrill and Saloon Bar on Shields Street is the place to go to mingle with fellow travellers. Located in downtown Cairns, the Woolshed typically draws in backpackers and students with a menu of cheap steaks, pizzas, and pub food; huge portions, brilliant nightly drink specials, a live DJ, dancing, contests, and an Absolut Vodka bar featuring more than 20 different flavoured vodkas ensure that there is always a large crowd here. At Cheaperthanhotels and Cheaperthancars we have a wide range of car rental discounts at convenient locations and accommodation to meet all budgets and taste. We really do believe that the less you spend, the more you will have to do when you get there.